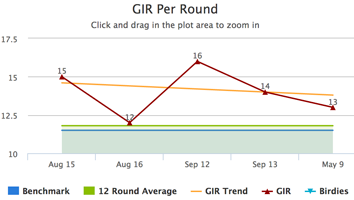 Total GIR is the count of holes that achieved GIR (Green in Regulation) out of the total number of holes included in the report. Higher number indicate better performance. Green In Regulation is when the green is reached on any hole in Par - 2 (or less) strokes, so when a player reaches the green in 1 stroke on a par 3, 2 strokes on a par 4 or 3 strokes on a par 5.